In a large saucepan, heat 2 tablespoons of oil over medium heat. Sauté garlic until fragrant, about 2 minutes. Add hand-crushed tomatoes, with juices, salt, and pepper to taste. Cover and let simmer for 20 minutes and while sauce simmers, cook ziti according to package directions. In ½ inch deep frying pan, heat remaining oil. Fry eggplant until tender, about 2-5 minutes, and place on paper towels to remove excess oil. 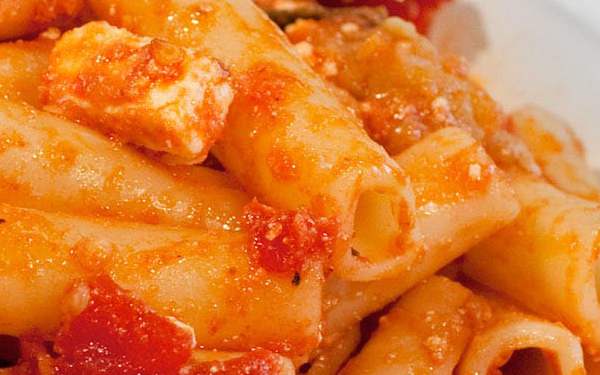 Add eggplant, ricotta and drained pasta to sauce, mixing well. Transfer to serving dish and serve immediately. Serves 4-6. Mario’s imported Italian Ricotta Salata for 6.99/lb ( 1/24/18 – 1/30/18 ).